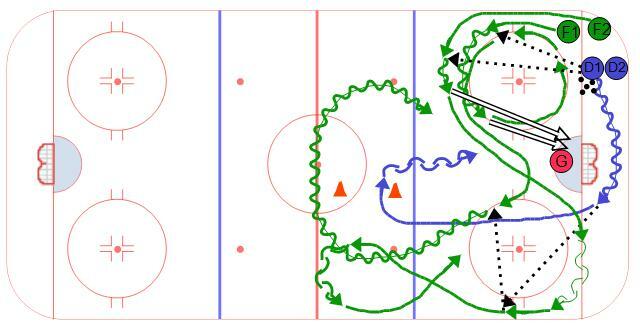 This is a variation of the Eagles half ice 1 on 1 drill. Now we add a forward to make it a 2 on 1. The forwards all line up in the corner without pucks. The defense line up just inside the forwards with the pucks as shown in the diagram. To start the drill F1 skates up along the boards and receives a pass from D1. F1 receives the pass, skates around the circle and takes a shot on net. F1 then continues around the circle. F2 follows F1 out of the corner and also receives a pass from D1 out of the corner. After their shot, F2 tranisions around the bottom of the other circle to receive a breakout pass from D1. F1 times their break into the slot to receive a pass from F2. F1 and F2 then continue outside the blue line and transition back against D1 in a 2 on 1 situation. Once through from both sides.